When artists in Berlin paint a Mona Lisa, it must of course be larger than the original in the Louvre. That's why the maxi copy of the famous portrait of Leonardo da Vinci (1452-1519) now adorns a large wall - the portrait is more than 16 meters high and eleven meters wide. 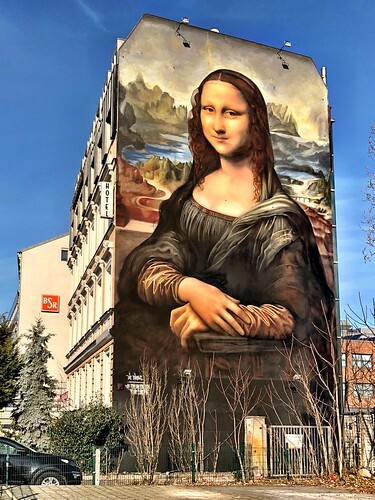 Directly opposite the painted remains of the Berlin Wall (East Side Gallery) in the Friedrichshain district, the new Mona Lisa should not lack attention. The Berlin artist collective Die Dixons, together with the artists Tank, Weisse Seite and FIX77, has painted the portrait on the wall of a hotel. The 170 square metre painting is now registered as a record attempt for the largest Mona Lisa. Wenn Künstler in Berlin eine Mona Lisa malen, muss sie natürlich größer sein als das Original im Louvre. Darum ziert die Maxi-Kopie des berühmten Porträts von Leonardo da Vinci (1452-1519) nun gleich eine große Wand - das Bildnis ist mehr als 16 Meter hoch und elf Meter breit. Direkt gegenüber den bemalten Resten der Berliner Mauer (East Side Gallery) im Stadtteil Friedrichshain dürfte es der neuen Mona Lisa nicht an Aufmerksamkeit fehlen.